A pleasant looking, multipurpose and durable kitchen gadget tool. A tribute item to my heritage. Weaved items Handmade by Sherlene may be used as a potholder, gripping pad, hot pad, or beverage coaster. A pleasant looking, multipurpose and durable kitchen gadget tool to have in every kitchen or work office. Q. 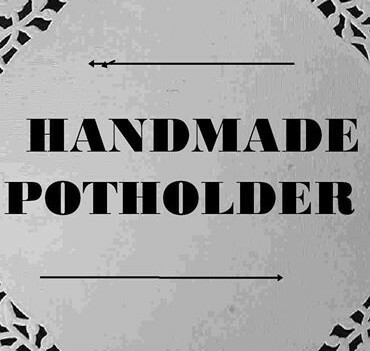 What size are the handmade potholders? A. The 8X8 design is generally considered a large- or traditional-size potholder. Nylon or cotton loops material quality. Cotton thread and other materials may be applied to your potholder design. Color(s) may vary slightly. The 6 X 6 design is the size of a decor tile; it is a perfect size for usage as a medium potholder, beverage coaster, furniture floor protector, or gripping pad for your kitchen pans. Personally, I like the variety of usage of the 6X6 design including decor designs that I create that are great for work place or home style. Q. Are the potholders safe to use in a kitchen? A. The materials used are durable. Do not use item under direct heat or above 300 - 350 degrees F.
It is suggested, for continued quality, item usage "after" baked dish has been cooled (for a few minutes) from a toaster over or regular oven. For example, carrying a casserole dish to your kitchen table should be fine. The perfect item to grasp plastic handle cookware. Q. May I reorder an item design? A. I can not guarantee if the same color design will be available. Items are distributed on a first-come-first-serve basis. Q. Do you accept personalized-design or -color(s) requests? Q. Do you deliver locally? A. Yes, the original price of each Handmade by Sherlene 'The Handmade Potholder' 8X8 potholder is $18, and each 6X6 potholder is $6. My local is Annapolis Mall to Church Circle main roads, and Eastern Shore except Salisbury and Cambridge. Q. How do I care for my purchased item? A. Handwash the item with similar colors, and air dry on a flat surface. You may need to flip the design to make certain of equal drying of the item. To maintain the quality of the item, I suggest using the nylon potholder design for home decor, trivet for cold items only, or usage as a beverage coaster. For more frequent usage as a hot pad or potholder, please purchase a multi-color cotton potholder design. Q. When will I receive items? A. Generally, no later than 6 - 10 business days. Items will be shipped to you via USPS or UPS. A. You must ship item(s) back for an even exchange. Please provide proof of purchase to expedite your replacement. Q. Does the online ordering have a customer service phone number? A. (888) 600-0805 ext. 1. Q. Do you accept wholesale proposals? A. Inquiries of wholesale proposals are welcome. Email Sherlene® Now! Proposals should include: Business Information and Contact Person, Quantity Requesting, Colors Requesting, and rate that you are willing to pay (including materials and shipping fees).